At Victron we really like Open Source projects. Here’s one recipe from Alan Major, for his desirable camper van. 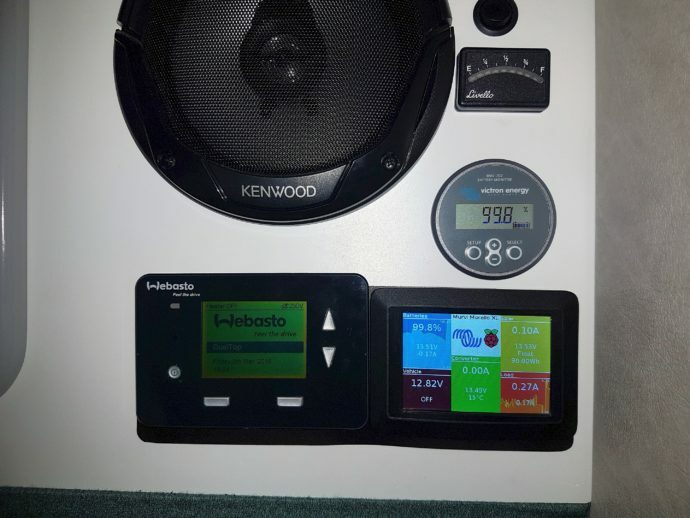 Inspired by Izak Burger and his successful porting of the Venus software to a Raspberry Pi, Alan decided to investigate Victron’s open source software and communication protocols – to see what he could do to address his specific needs. In his own words, this is how Alan baked his homebrewed Pi. “In our first 7 years of retirement my wife and have been fortunate to be able to travel extensively in our Murvi campervan including visits to the Orkneys, Shetlands, the Faroe Islands and Iceland. During this time we developed a love of remote areas. Our ‘van is a ‘panel van conversion’, i.e. the standard steel van body is retained with cut-outs made where necessary for windows, hatches and skylights. This approach has amongst its advantages the fact that original vehicle dimensions and body integrity are retained, both of which are useful considerations given the nature of the roads in the areas we prefer to visit. When the opportunity came to replace our ‘van we decided without hesitation that it would be an almost ‘like for like’ replacement but with an updated specification taking advantage of the technological advances that had occurred since the purchase of our first ‘van. One such advance was in battery technology and more particularly LiFePO4 (LFP) batteries. The benefits offered by LFP batteries seemed to match exactly what we needed if we were to enhance our ability to travel to and enjoy remote sites. 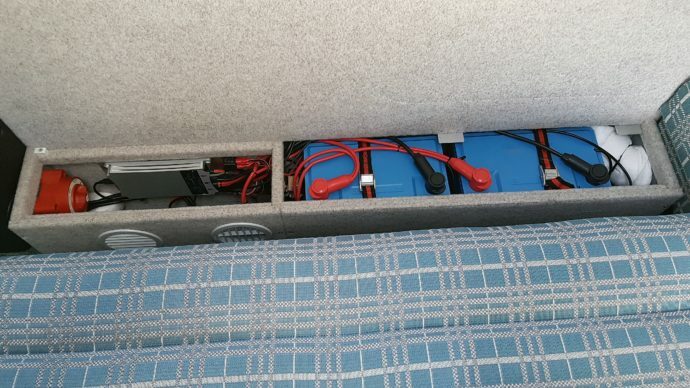 The deeper discharge ability, more efficient recharging and lower weight helped greatly alleviate the compromises on space, weight and power reserves that were needed when deciding on the specifications for a campervan. We were lucky in that Murvi, a small independent UK based converter of panel vans, are very flexible when it comes to accommodating owner’s requirements. They were using Victron equipment within their battery systems and I had previous experience of the brand from our days of yacht ownership. So I began my research on the website of Victron Energy and very quickly concluded that they would be my preferred equipment manufacturer as the range of components offered seem to include everything I would need for my proposed installation. I felt that it was important that the system should comprise of components from just one manufacturer to avoid any conflicts which could occur if problems arose with components from multiple suppliers. On their website Victron publish datasheets, manuals and technical papers covering their equipment and data communication protocols. Using these reference sources I was able to design a system that I felt would be suitable for our ‘van. For some a noticeable omission from this list is an inverter but we have learnt not to rely on mains powered equipment. In practice our most demanding power consumers are our 85 litre compressor fridge and diesel powered water/cabin heater. Over the course of our first year (132 nights away) with this system we have found that our power needs have been satisfied without recourse to additional mains or alternator charging in all but two situations. On both these occasions we had been stationary for 4 days or more and in the first we had sought shade to gain relief from the high summer temperatures in Spain and the second we needed heating to beat the cold of dull winter days in the UK. 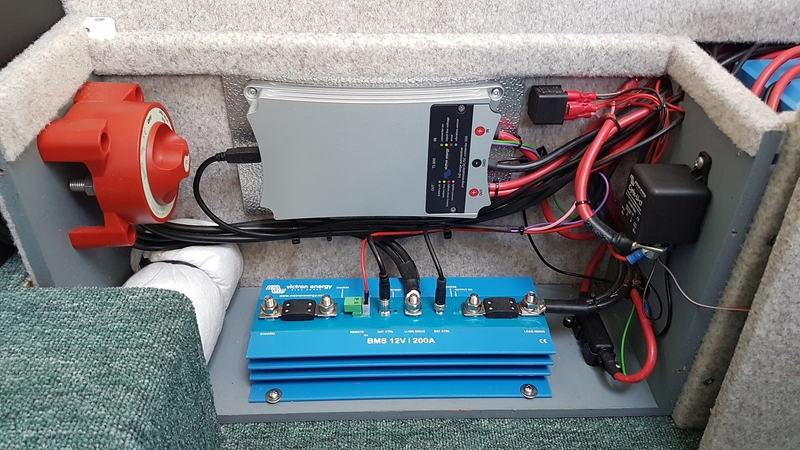 In each case our power needs were far in excess of our battery capacity and ability to harvest power from our solar panels so the convenience of an EHU (mains electric supply) was utilised rather than rely on the vehicle alternator. To learn in detail about Alan’s recipe visit the victronPi Murvi Chronicle. 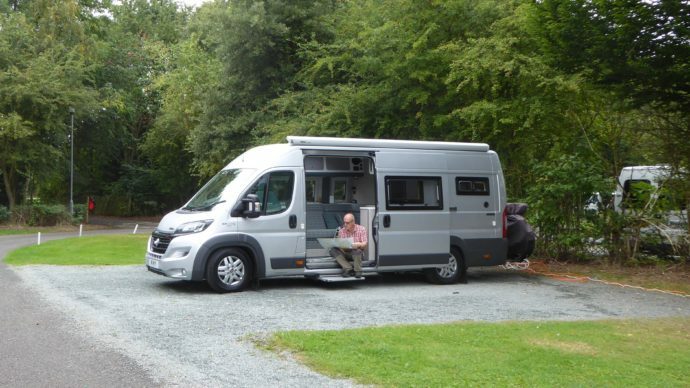 We thank Alan for the information and images used in this blog and wish he and his wife many happy travels in their Victron enhanced campervan. Maybe you’re inspired to create your own Pi recipe? 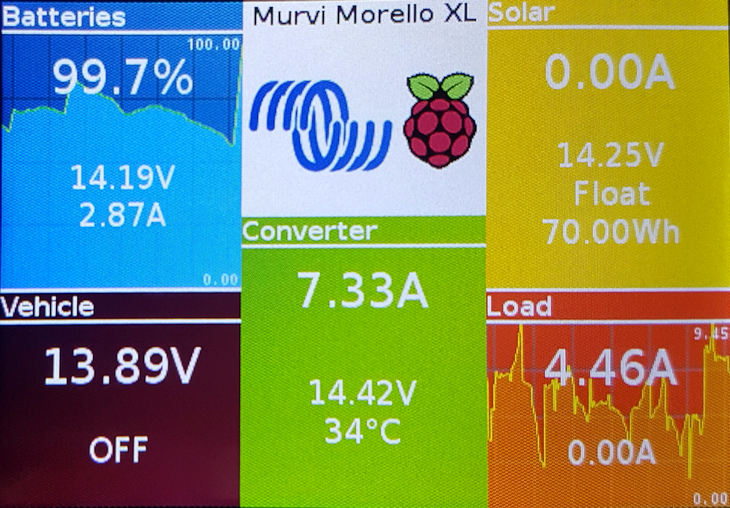 If so here’s another to whet [sic] your appetite, maybe even literally – Markus Pauritsch and his Hydro Power Pi. More about Victron Energy & Open Source. If you have an open source project you’d like to tell us about, please leave a comment in Disqus below. We’d love to hear from you! On the road - with a professional sailor.